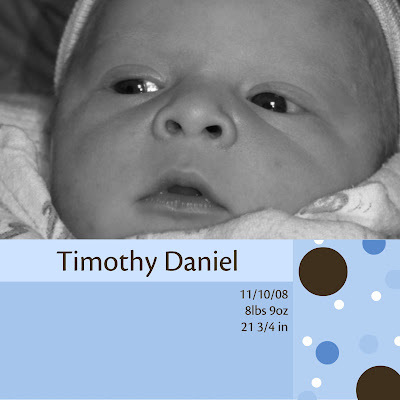 Yesterday I had the absolute pleasure to get to go see my new nephew, Timothy on the day he was born. If you know anything about me, it's that I LOVE babies - the smell, the feel, the cuddliness (is that a word?)... so, I'd like to say that I have been anticipating the arrival of my new baby nephew almost as much as his mommy & daddy and big sister Katie. 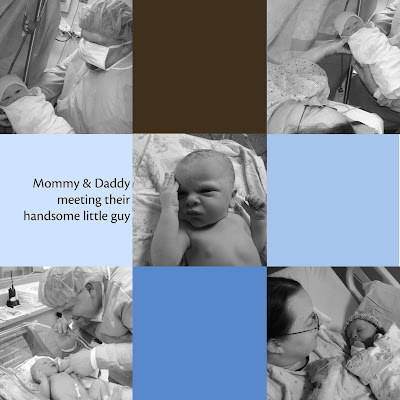 So, it was with lots of excitement that I headed to the hospital, daughters & camera in tow, with the intention of holding that sweet new baby, taking tons of pictures and, well, getting my baby quota for the week. 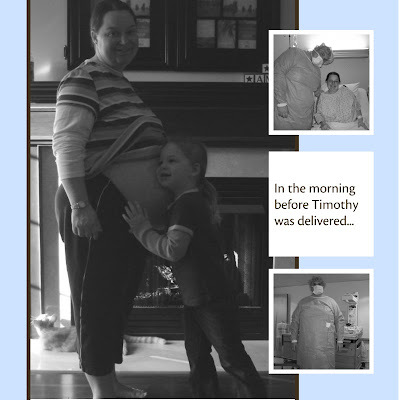 Katie giving mommy & Timmy a hug goodbye in the morning before school (and the "big day"). Check it out! This year they found scrubs to fit Chris!!!! Poor Julie wasn't feeling very well after delivering Timmy, however Timmy was quite wide-eyed & bushy-tailed for HOURS after being born. ps Aren't they adorable together!?! 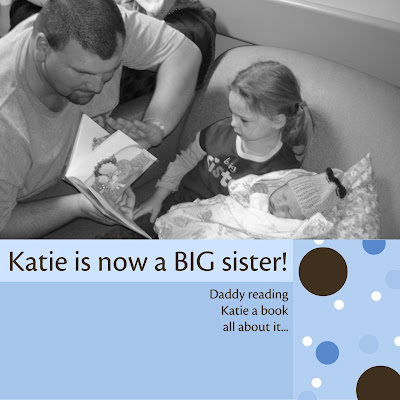 Katie got lots & lots of books about becoming a big sister and daddy even read them to her while she held her baby brother for the first time. Katie also got LOTS of presents. So many that it was like it was her birthday too! 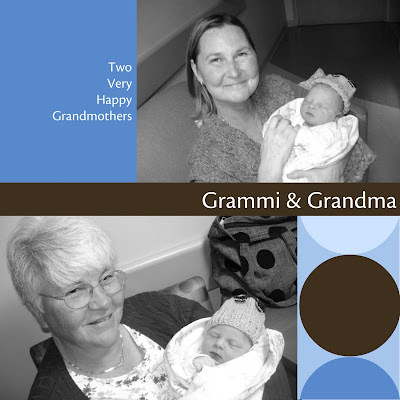 Of course Timmy was visited by both of his grandmothers and some of his aunts too (me included) So many family members already love this baby so much! 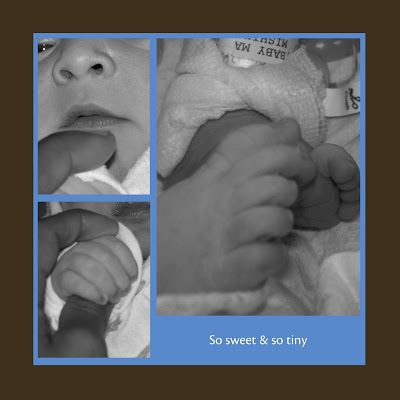 ps If you woul like to see some more pictures that I took of my girls and Timmy, please check out my blog. Yay Julie and fam! I'm so excited for you all. Timmy is adorable! I was thinking about you all day. So glad all is well, and I hope you have an uneventful recovery. :) Congratulations! He is perfect! Congratulations! I a so excited for you all! 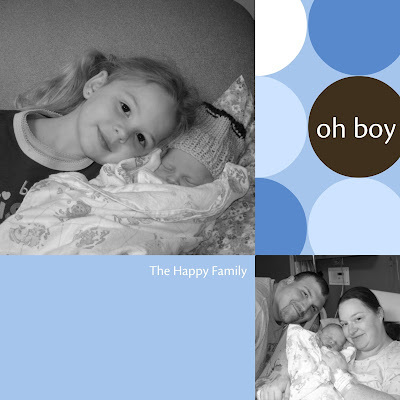 Congrats Bouf family! He is so precious! Katie looks like a wonderful big sister! Comming over from Debi's blog. Congratulations! He is truly an adorable baby. And your little girl is stunning - love the photo of the two of them. what a great post! congrats julie! i told you it would be over before you knew it. katie is so freakin cute w/ him. i cant wait to see you guys soon. Congrats!!!!! He is so beautiful! Debi, what a wonderful post you did....how sweet of you!! Congratulations! I am so excited for you all. I cant wait to see him.